Android, as with most operating systems that we are familiar with, provides you with a list of the most recent apps that you have used. This is not like Microsoft's start menu, which populates itself with the apps/programs that you use the most, Android's is truly chronological, where last used is first on the list. Again with a Microsoft reference, try hitting Alt + Tab on your keyboard... It looks more like that, but performs a few more functions. The recent apps list serves two main functions, first, providing you with quick access to those apps. Second, and this one is a lot more complicated, to show you the apps that are still 'running' on your device - this is a little misleading, I'll explain later. On older versions of Android, you would press and hold your home button until the list pops up, newer versions have replaced the dedicated 'settings' button with the onscreen buttons for back, home and Recent. Click this and the list pops up. The benefits of using the Recent Apps menu is that you do not need to close out your currently running app so to enter the main Apps menu to start another application, if you've recently used an app, it will be there ready to fire up again. 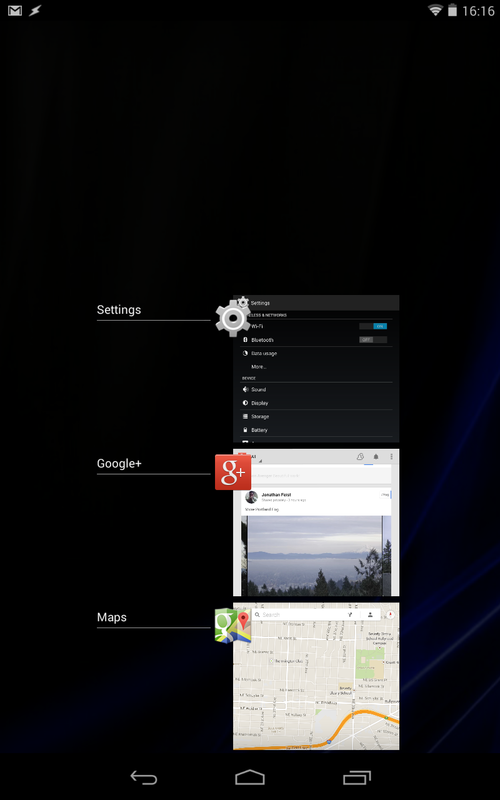 Boring stuff, but a huge advantage in device navigation. Now, the curveballs, just because an app is in the Recent list, does not mean it is still running! The system controls how background apps are handled, including when they are to be fully shutdown. An app will generally stay loaded in the background, ready to resume, if the system does not run out of resources to do so. Always save your work and progress before you leave an app for any reason, it may shutdown completely any time you are not actively using it. The flip side to apps shutting down is that swiping an app to the side, removing it from the Recent Apps list, usually shuts down the app, but not always. It leaves complete shutdown for the system to handle, and usually does not kill background services, such as email syncing. I just wanted to make sure you were aware that this action does not officially 'close' an app, but for everyday purposes, it is more than sufficient. My personal recommendation is how I handle my devices, I only keep a small handful of very frequently used apps in the recent list. You may wish to test your apps, you will find that some open the same way whether completely closed or kept in the recent list. Others, as eluded to, may have a long startup procedure that is skipped by keeping the app in the Recent list, such as games that check the server for updates before they start up. How do you use your Recent list? OK, that is a long question, let's go this way, do you have more or less than 4 apps in your list?